This was one of four design ideas for the Scott Bookcase – one of my favorites. For this blog post, I thought about a title like “Life Throws You Curve Balls”. My dad was rushed to the hospital this past Monday with chest pains. A scary situation for sure, but he is OK. The doctors suspect that these pains are not related to his heart, but they are still running tests to see what is going on. I was at the hospital all day Monday and for about an hour yesterday evening. 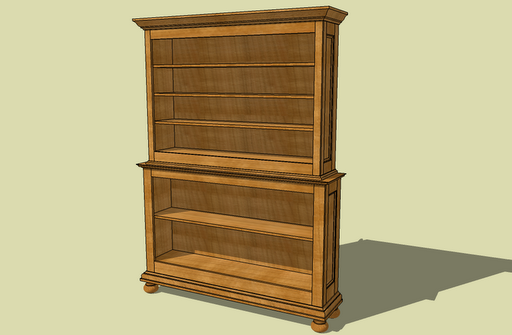 As you might expect, very little woodworking has been accomplished in the past few days, so I am re-running the next installment in the Scott Bookcase project. Today, I am linking to an old blog post about the design process which included two client meetings and several emails. This blog post was actually written about a year after the bookcase was completed and was planned to be a lead-up to my first ever video blog post. I never completed the video, but the blog post goes over the four designs – design number three was the most interesting, but would have been a bear to build. The final design idea repeats a little of what discussed in my first re-run of this build process, but that is the result of this post appearing separately from the series on the construction process. To see the blog post, click here. On a side note, I liked the molding and bun feet design seen in the image above so much that I used a slightly modified version of it on my award winning Architectural Bookcase plan (see it here).